Today my good friend Bill and I went for a quick spin to Galetta, Dunrobin and Kanata in search of Owls and Grey Partridge. I had to admit going out at 9:30am, I really didn’t hold out much hope. Lolol..and I sure wasn’t wrong. We drove for 2 1/2 hours and except for the odd Crow or Raven, we didn’t see very much. I decided to go to the Vydon Acres an area that at times has been great for Owls. As we were driving near the entrance road to Morris Island, movement caught my eye. 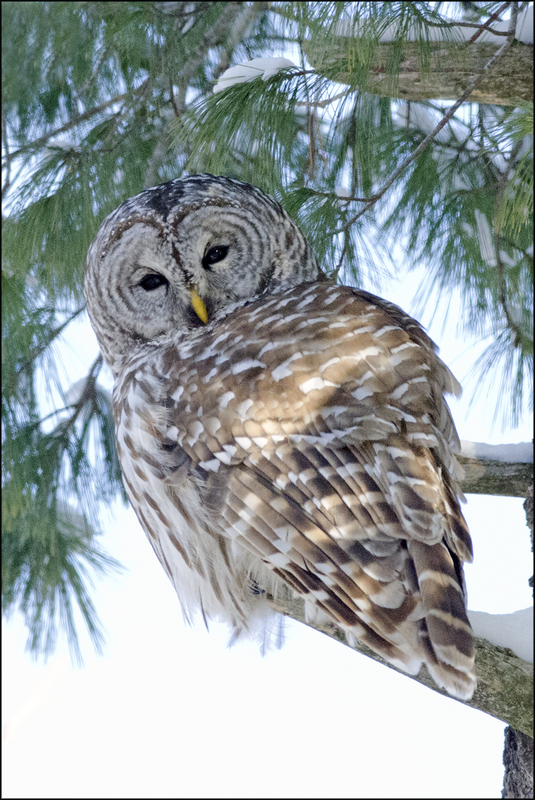 We quickly pulled over and walk back 20 yards and in a tree looking down at us was a lovely Barred Owl….my first bird photo of 2013. A great way to start.